Some mobile Skylanders news again. After last week's update to the iOS version Skylanders: Battlegrounds has now also joined Cloud Patrol in becoming available on Android. 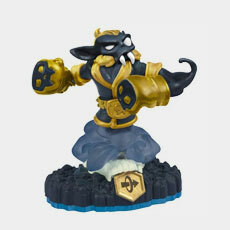 The Dark Days event in the still-iOS-exclusive Skylanders: Lost Islands has concluded and a new companion has arrived. 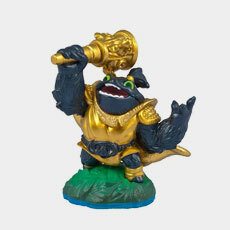 New companion Marshal Wheellock from Skylanders: Swap Force has joined in, he doubles the Hero Points you get but'll cost 900 Gems. If you don't have the toy then fear not, Volcanic Eruptor can now be bought for 250 Gems. This week's Super Tuesday has brought back all of the Giant and Sidekick Houses for one day only. And last Friday saw the release of Birthday Bash, the new Alter Ego for November. Win him in the Wishin' Well all month. And the Frito-Lay sweepstakes for Quickdraw Rattle Shake has officially begun, albeit with a bit of a rocky start. Toys R Us are due to release their remaining Legendary Skylanders from Skylanders: Swap Force over the next few weeks. According to an advert Legendary Zoo Lou will be out first on the 3rd of November (this Sunday) followed by Legendary Night Shift a week after on the 10th. Last week saw the long quiet Skylanders: Battlegrounds finally get an update, it added the third chapter at last as well as implementing the new Swap Force characters. Just a small update to Skylanders: Lost Islands this week. Dark Stealth Elf and Dark Blast Zone are now purchasable in game. They cost 200 and 300 Gems. A new house, Dark House, houses any of the Dark Skylanders in the same way the Dragon Lair houses dragons. It'll cost you the same 1200 Gems though. Remember that November's alter ego will be appearing on Friday but that also means that Thursday is your last chance to get Skeletal Cynder before she disappears from the Wishin' Well. 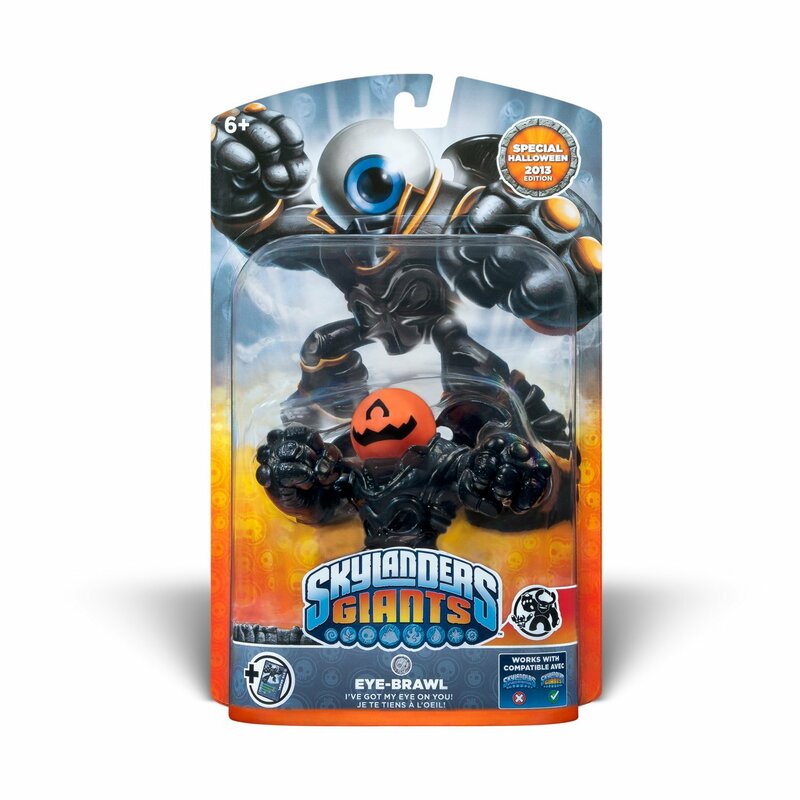 Later this week will apparently see the release of a special variant of the giant Eye-Brawl, it's already been spotted in a few places in Canada. 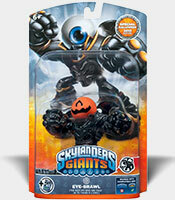 The "Special Halloween 2013 Edition" Eye-Brawl, more commonly referred to as Pumpkin Eye-Brawl thanks to his distinctive orange pumpkin-like eye-ball, is not an in-game variant and will appear exactly the same as a regular Eye-Brawl when playing just like the Glow-in-the-Dark editions of characters like Cynder and Sonic Boom that you might already own. It does however have the same "Special" tag that makes it distinct in the collection screen even if it doesn't look or behave any differently. A quiet one for Skylanders: Lost Islands this week, Eye-Small is more widely available and the month's Alter-Ego gets his Hut. Eye-Small joins Lost Islands properly, you can now buy him for 300 Gems. Autumn Stump Smash gets his own Hut for 350 Gems. A new Wood Stack House for level 39 that can house 3200 Mabu. And in news for a related game, the previously exclusive to iOS Skylanders: Battlegrounds has been announced for the LG Smart TV platform and is due out "this holiday season". Here's hoping they remember to finish it off this time.